To find homes within your customer database that are likely to list, Mortech Protection uses a number of different factors and data points. While they’re incredibly granular, they can be split up and grouped into four different categories. While Mortech Protection takes things like home details and previous history into account, the focal point of our product lies within the Zillow data it references. 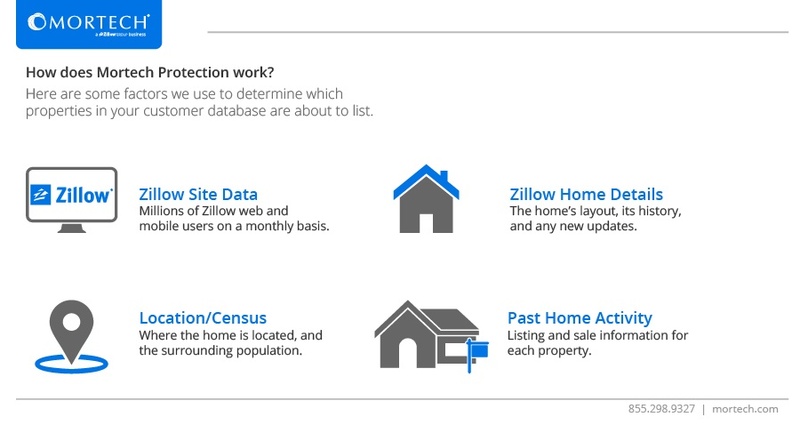 Because of the millions of monthly visitors to Zillow’s website and mobile apps, we have rich data to factor into our process of finding potential properties in your customer database that may list soon. Once we identify those potential listings, we send the results back to you, and you get to decide when and how you message them. It’s that simple. Big data has long since been the driving force behind modern technology, and the mortgage industry is no exception. By using Zillow data, and cross referencing it with your properties, retaining your current customers and spending your marketing dollars more efficiently has never been easier to do. To learn more about Mortech Protection and discuss how you can start using it today, contact us using the button below.